As a soon-to-be graduate of the Simmons College Graduate School of Library and Information Science with a focus in Archives, I was recently required to complete a 130-hour internship meant to strengthen the skills I learned throughout the program. When Digital Archivist Erica Boudreau approached me about an internship at the John F. Kennedy Presidential Library, I jumped at the chance. Although I already worked at the Library digitizing negatives from the White House Photographs collection, this new internship would allow me the opportunity to expand my experience by digitizing, cataloging, and publishing to the Web a small manuscript collection in its entirety. JWPP-001-004-p0039. 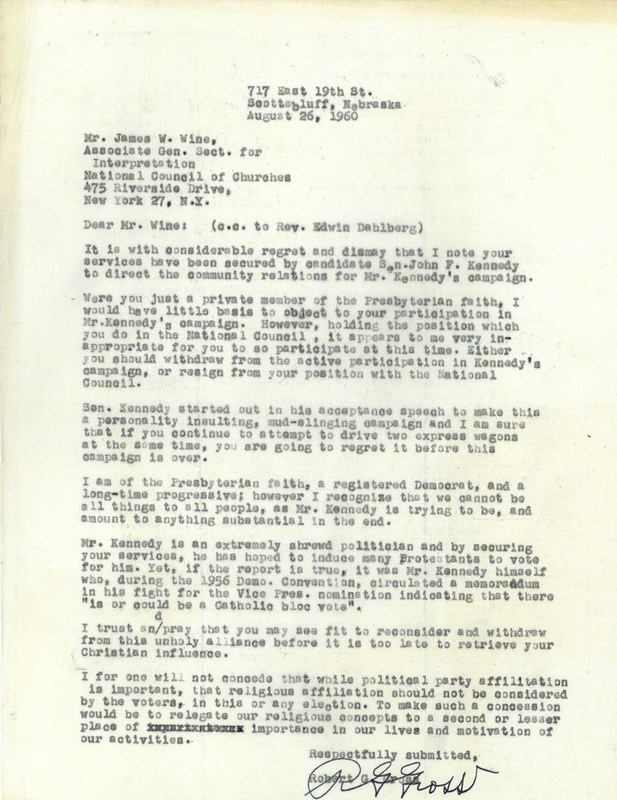 Letter condemning James Wine for joining the Kennedy presidential campaign. View entire folder here. For this project I was assigned the processed papers of James W. Wine. Spanning the years 1959 to 1965, the papers consist of over 800 pages of documents and photographs relating to James Wine’s work on John F. Kennedy’s 1960 presidential campaign and later as U.S. Ambassador. In his capacity as an advisor to then Senator Kennedy, Wine—a Protestant—worked to dispel the public’s fear of voting for a Catholic president. This problem was known as “the religious question.” The concern about President Kennedy’s Catholicism was widespread and Wine received numerous letters deploring his decision to help the Kennedys. By distributing pamphlets and writing statements and press releases, Wine’s work directly influenced the public’s choice of John F. Kennedy as President. After working on the presidential campaign, Wine became Ambassador to Luxembourg and soon after, the Ivory Coast. As a representative of the United States and of President Kennedy, Wine conducted business that facilitated direct communication among the countries’ politicians and between the President and foreign Heads of State. JWPP-001-011-p0017. 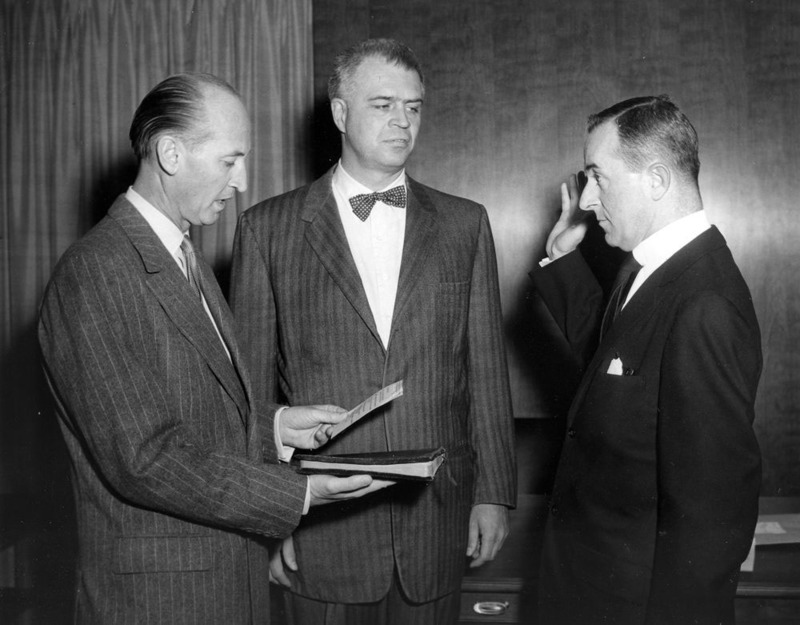 James Wine being sworn in as Ambassador to Luxembourg. View entire folder here. I began my internship by reviewing the collection (which was processed in 2005 by a fellow Simmons intern) to familiarize myself with the materials and to learn more about James Wine and his work for John F. Kennedy. Although I was already familiar with the history surrounding Kennedy’s presidency, I had not heard of James Wine and did not know much about the “religious question.” More than anything, I was surprised by the level of concern expressed by the American public about Kennedy’s religion before he took office. As I learned more about James Wine’s work within the campaign, I began to draw parallels between President Kennedy’s fight and current political events. The next step was to digitize all of the materials within the collection. Working closely with Kelly Francis, the Assistant Digital Archivist for Textual Collections, we began the process of digitization. Each document was scanned to standards set by NARA and the John F. Kennedy Presidential Library and then reviewed for proper quality control. JWPP-001-010-p0025. 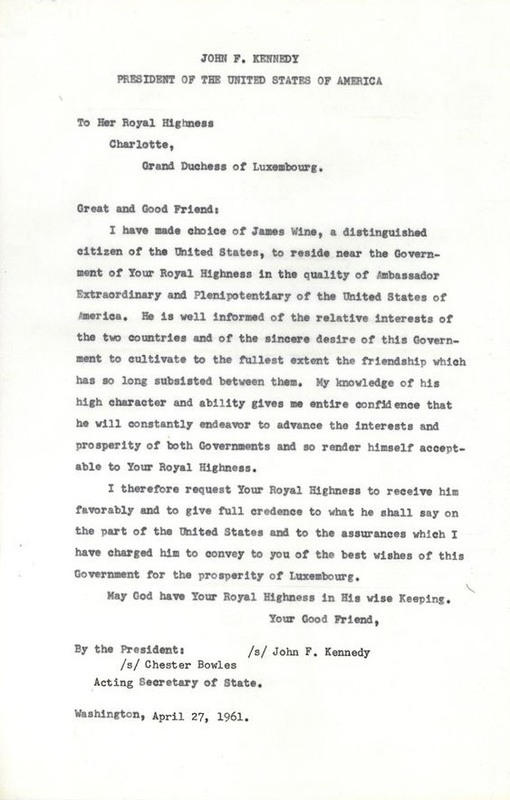 Letter from President Kennedy to Her Royal Highness Charlotte, Grand Duchess of Luxembourg, announcing James Wine’s appointment as Ambassador to Luxembourg. View entire folder here. Following digitization, I began the work of cataloging and describing the collection. Working folder by folder, I reviewed the materials, looking for documents that stood out and identifying a general theme within every folder. From there I began to describe each folder to the best of my ability. With Kelly’s help, I learned tricks of the trade for creating good metadata and after repeated edits the cataloging was complete. With digitization and description completed, the collection was published online; it can now be found on the library’s website here: finding aid | digitized collection. After spending four months working on James Wine’s papers it was hard to believe that it was over. In that short period of time I felt that I had formed a connection to Wine during that time in his life. Through his political work and his personal correspondence between friends, I had a firsthand look into his life and work. What I’ve taken from this experience and what I am most grateful for is the confirmation that I have chosen the right career. My internship with the John F. Kennedy Presidential Library has helped me better understand the work that goes into digitizing a collection and has made me feel more confident that I belong within the field of archives and archives digitization.